When it debuted in 2002, Without A Trace (WAT) was a highly entertaining and well-acted drama about a fictional FBI Missing Persons Unit. 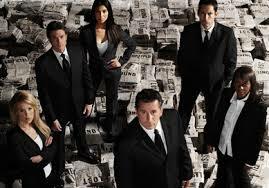 In its second season, the series matured brilliantly into one of the best series on television. The dynamism that propelled the freshman and sophomore years dulled a bit in the still-often-decent third and fourth seasons, but midway through the fourth season, the clever plotting and subtle character development began a slow and heartbreaking disintegration. Despite occasional brief resurgences, by the time WAT was cancelled after its seventh season, it was an emaciated shadow of its former self, yet it always could have easily returned to greatness. An exceptional ensemble cast made the show sparkle. Jack Malone (Anthony LaPaglia) starred as the hard-and-sharp-as-nails director who couldn’t save his crumbling personal life. Samantha Spade (Poppy Montgomery), Vivian Johnson (Marianne Jean-Baptiste), Danny Taylor (Enrique Murciano), and Martin Fitzgerald (Eric Close) rounded out the cast. Every episode provided a little insight into each character’s life and mentality, sometimes through throwaway lines, sometimes through heartfelt monologues. By the second and third seasons, intense character arcs such as the past relationship between Jack and Sam, the budding relationship between Sam and Martin, Danny’s bond with his estranged convict brother, Martin and Vivian’s reactions to a fatal shooting, and Jack’s family issues all contributed to creating real and sympathetic characters. There was a solid sense that the writers knew everything about these characters’ pasts and psychology, and were gradually and skillfully revealing these details to the audience. In the fourth season, the carefully crafted character development began to unravel. A sixth detective was added to the cast: Elena Delgado (Rosalyn Sanchez); and her presence would appeal to some fans and put off others. Unfortunately, heavy attention on her character meant that the rest of the supporting cast often received short thrift. This was especially sad in Vivian’s case. Jean-Baptiste was by far the show’s strongest actress, but she was frequently and cruelly shortchanged, sometimes getting as little as three or four lines an episode. Furthermore, after the fourth season, the adroit character storylines fell apart. Some plots, such as Vivian’s health problems and Martin’s painkiller addiction, were introduced with great dramatic fanfare, played up for a half-dozen episodes, and then abruptly dropped, referenced in a fifth season episode, and then completely abandoned. Continuity regarding character development disintegrated. During the final three seasons, Vivian, Danny, and Martin’s characters were rarely developed at all, and their connections to the other cast members were largely severed. Vivian began as Jack’s longtime confidante, but the writers made them drift apart. Danny and Martin started the show as antagonistic rivals, but soon won each other over and became best buddies. Their banter added humor to the show, but by the last two seasons their rapport was kicked offscreen. A romance between Danny and Elena started in the fifth season, went unmentioned in season six, and was then abruptly brought back in season seven. The growing attraction between Martin and Sam featured prominently in the first two seasons, then moved from rocky secret relationship to breakup to a sibling-like connection over the next three seasons. In season seven? You’d barely know that they were even friends at work, given their maybe ten minutes of screen time together the whole final season. Aside from some disproportionate time spent on Elena, only the leads received much attention in seasons six and seven. The integration of Montgomery’s real-life pregnancy and boyfriend into the plot derailed her connections to the rest of the cast. Revelations regarding Sam’s past were mishandled badly, and the on-again, off-again relationship between Jack and Sam was one-tenth-heartedly resumed in the final season, botched, and settled blandly in the finale. Worst of all, Jack Malone was originally a detective who specialized in psychological insight and mental tactics, but the later seasons turned him into a knockoff of Jack Bauer. Where the Jack of the early seasons cracked suspects by finding the chinks in their mental armor, the Jack of the later seasons turned to guns and threats of violence in order to get information. The series had its share of rotten apples even during its glory days. Some episodes, such as one that presented Catholic officials as sinister and surreptitious, one with a speech declaring that “abortion is a Christian act,” a horribly misguided one-off attempt to play the show as a comedy involving agoraphobic lesbians, and one disturbing ending that attempted to romanticize ritual murder would be enough to put potential viewers off the show completely if they saw any of these episodes first. Although the show could plunge to disturbing depths, it could also ascend to magnificent heights. The early seasons were full of gems, including a three-episode arc involving a predatory headmaster who became Jack’s arch-nemesis. In another classic episode, a pair of identical twins, one innocent, one guilty, became suspects in a disappearance, and the team had to determine culpability. Two open-ended episodes, one involving a convicted killer on death row, the other attacking media bias on racial issues, managed to make their ambiguous finales compelling rather than merely frustrating. A desperate father (Charles S. Dutton, in an Emmy-winning performance) attempting to find the son who had been kidnapped years earlier made for some of the series’ most poignant moments. Other treasures involved a hostage crisis connected to 9/11, an overachieving high school student vainly trying to hide a secret, the emotional fallout from Jack’s disintegrating family life, and a storyline revolving around Jack’s Alzheimer’s-afflicted father (Martin Landau). Arguably the series’ finest moment was “Wannabe,” a second-season masterpiece about a missing boy and the hell that peer pressure and adolescent bullying can create. During the latter half of the show’s run, truly great episodes became nonexistent. The surprising twists faded as pedestrian, cookie-cutter episodes proliferated, and the subtle glimpses at the characters’ personal lives devolved into soap opera. The actors did the best they could with flat dialogue, and indeed, the show’s woes were attributable almost entirely to the writers. A show about finding missing persons is different from a show about solving murders. With a disappearance, the missing person can be found alive and well, be murdered, or never be located. What is crucial is that the viewer care about the victims and want them to be found or avenged. In a murder, it’s O.K. if the viewer feels nothing more than a passing twinge of pity for a corpse, but in a missing persons case, not caring whether or not the individual in question is ever found means the whole episode falls flat. The first few seasons created missing persons the viewer could sympathize with or at least be interested in. When they were rescued, the viewers cheered; when they were dead, the viewers cried. The last few seasons? When you have missing persons like dental floss– about as close to being one-dimensional as you can get– there’s no impetus for watching the show. As opposed to the glory days when you hoped that a war veteran or schizophrenic girl would come home safe, the mediocre episodes could have pulled more heartstrings by kidnapping a coatrack. Clichés also crippled the series. You can only hear the line “(Name of supposed parent) isn’t (Name of child)’s real father!” so many times before you want to throw a footstool at the screen. A little imagination could have provided dozens of original reasons for a person to willingly vanish, or ways to hide a body, or at least create some suitably hateful villains. By season seven, the family reunion scenes had the punch of a geriatric arthritic boxer, the viewer knew that would-be saints always had a dark secret in their past, that if the missing person was accused of a crime that someone else was probably responsible, and that if the missing person turned his back on another character in the final flashback scenes that he would be murdered approximately one-eighth of a second later. Most of the later episodes weren’t bad so much as unoriginal. Careful examination of the last few seasons shows that most of the later episodes fall into one of approximately three main templates, without any twists worth mentioning. All these complaints disguise the fact that WAT’s early seasons were so engaging, suspenseful, clever, emotionally involving without being manipulative, and psychologically well-rounded. After a long delay after disappointing sales for seasons one and two, the last five seasons were also released on DVD. Despite the decline in quality, the show didn’t deserve cancellation. With better scripts to motivate the cast, WAT could easily have been rejuvenated into stellar television. As it is, one can only hope that the cast finds new projects worthy of their talents. Sometimes older Female Graphic Novel are revived by a fixed or movable upright partition used to divide a room and a person who has written a particular text and directors rather than publishing houses.